place never visited before + good price = Sofija books it. We have heard of Ibiza before as a place of never-ending parties and amazing music festivals. However, our experience of Ibiza was different, including hidden gem we came across called Formentera. Unfortunately, our flight was a very negative experience. As you can imagine our low cost flight to Ibiza was full of party groups that were heavily under “the influence”. This is the first time we started questioning why there is no security on these types of flights. Therefore, we would like to warn any people travelling with children that this is not a “family friendly” journey. We landed on Sunday afternoon, in Ibiza airport, which actually was on strike. Note – not all Supermarket in Ibiza are opened on Sundays! Important to remember if you stay in self-catering places and you hope to stock food on the day of landing. We weren’t sure about the taxi prices so decided to book a shuttle service from the airport to the apartment before we flew to Ibiza. Probably it wasn’t the best decision as our driver was late and when we compared the prices it turned out taxis are relatively inexpensive and probably it would have been cheaper and faster to take a taxi instead. Uber also operates in Ibiza, but we haven’t tried it. Once we arrived to our accommodation the excitement levels went back up as our hotel was located near the beach. We had such a great view from our balcony of the sea. We also loved hearing wild parrots singing, which sounded more like whistling at people – it was very entertaining as initially Artur thought that somebody catcalling us, only later we discovered that it was parrots. Check our review for Apartamentos Lido here. We went to the centre of Ibiza town, where we discovered a beautiful Dalt Villa, which means “upper town”, basically, Ibiza’s old town. We spent at least 5 hours in there. It is definitely worth a visit if you are planning to stay in Ibiza town. Note- old town is not fully accessible for people with physical disabilities. 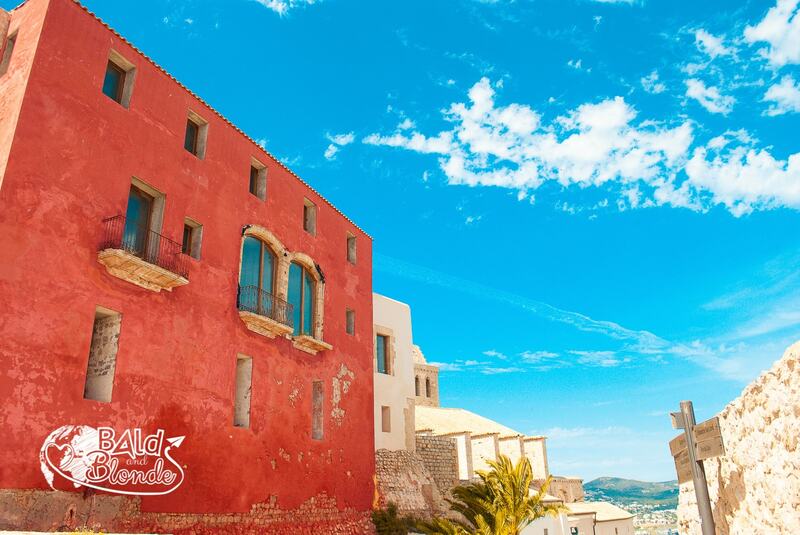 While exploring Dalt Vila there were many opportunities to buy some small souvenirs and grab a quick snack and drink. Narrow streets, blossoming flowers and amazing weather created a very romantic and enjoyable atmosphere for us to explore this beautiful place. To be honest – we haven’t heard about Formentera before. We actually have learnt about it only in Ibiza – you can see tour stands to the island at every port as well as in Ibiza Town itself. That’s very good, because we would recommend everyone to go there once they land in Ibiza. Beaches on Formentera are considered the most beautiful in Europe. On our last day we had a final stroll around the town. Architecture in Ibiza looks familiar to many other hot countries. Predominantly you can see brightly coloured buildings with minimalistic, simple design. Pavements and roads made out of rocks are very common, especially in touristic areas on the hills like Ibiza Cathedral. There are many nice cafes with friendly staff welcoming you while you wander around. We have went to Bar Ca’n Rafal for a final cocktail. We can’t imagine being in Spanish-speaking country and not having a mojito. On our way back we went through Ibiza Marina, where we came across intriguing open exhibition of Sebastião Salgado, called Genesis. This exhibition contained a selection of photographs taken by Salgado, including places like Antarctica, Madagascar, Botswana, Zambia, Alaska, the Galapagos, Siberia or the Amazon. Throughout our trip we have heavily relied on google-maps. On the day of our departure we have taken bus to the airport from the bus stop not far from our apartment. It wasn’t too late (acceptable ±10 minutes), we bought the tickets from the bus driver (photo here) and we drove to the airport in a clean, ventilated bus. The bus wasn’t busy at all; therefore, it was peaceful and enjoyable trip. Allowed us also to take a closer look at the driving culture. Overall we thoroughly enjoyed our stay in Ibiza as we discovered it from completely different side. As we said before, exploring Formentera by cycling around the island was a highlight for us. We came across some of the worlds most beautiful beaches and this trip will stay in our memories forever. We hope you got a little bit of taste of our experience in Ibiza, which will encourage you also to look into organising a short (or long) holiday to Ibiza with your loved ones.